The Scotts Miracle-Gro Company is an American multinational corporation headquartered in Marysville, Ohio, where O.M. Scott began selling lawn seed in 1868. The company is considered an industry leader in the lawn and garden market, with regional offices and research facilities across the U.S. and businesses in Canada, Europe and Asia Pacific. In the U.S., the company's Scotts, Miracle-Gro and Ortho brands are market leading in their categories, as is the consumer Roundup brand, which is marketed in North America and most of Europe exclusively by Scotts. Outside of North America, the company's brands include Miracle-Gro, Evergreen, KB, Fertiligene, Celaflor and Substral. The Scotts Miracle-Gro Company manufactures and provides do-it-yourself lawn, garden and home protection products in North America, Europe, and Asia Pacific. Among their offerings are consumer fertilizers, plant foods, soils and mulches, pest controls, grass seed and bird food. The company's principal consumer brands in North America are Scotts, Miracle-Gro, and Ortho. In addition, Scotts is Monsanto's exclusive agent for the marketing and distribution of consumer Roundup. Scotts LawnService serves the "do-it-for-me" consumer in the U.S. with on-site lawn, tree and shrub fertilization, insect control and other related services through its network of 160 locations. Scotts LawnService is considered a leader of this USD$5 billion category. In 2013, the company reported net sales of $2.82 billion, a 9% increase in the second half of the year, and an adjusted income of $174.4 million. Scotts was founded in 1868, by Orlando Scott as a premium seed company for the U.S. agricultural industry. In the early 1900s, the company began a lawn grass seed business for homeowners and, in 1924, became the first to ship grass seed products directly to stores. Prior to that, consumers could purchase Scotts seed only through the mail. By 1940, Scotts's sales had reached $1,000,000 and the company had 66 associates. For the next 15 years the company focused on developing new products to combat weeds, fertilize grass and develop automated electronic seed processing and packaging plants. In the early 1960s, Scotts started selling a "program" of products for lawns; established special training classes to help retailers better assist customers in developing their lawns; received a U.S. Patent for Trionized bonding which produced fertilizers that delivered sustained feeding; and introduced a complete line of Turf Builder combination products. 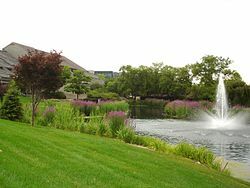 By the end of 1971, the company had added two new divisions to its portfolio: the Golf Course Division, developed to promote an exclusive line of professional products for golf courses and other large institutional accounts; and Scotts LawnService, established after Scotts found a significant "do-it-for-me" customer segmentation. The service offers on-site lawn, tree and shrub fertilization, insect control and other related services through its network of 160 locations. The company also launched a direct-to-consumer helpline allowing lawn owners to call Scotts for advice and assistance. Later that year, privately owned O.M. Scott & Sons was purchased by ITT, the international business conglomerate. Fifteen years later, Scotts became an independent company through a leveraged buyout from ITT. In 1992, Scotts became a publicly traded company with an initial offering of $19.00 a share. Three years later, it merged with Miracle-Gro, a gardening company, to create the Scotts Miracle-Gro Company. On January 27, 2012, Scotts Miracle-Gro agreed to plead guilty in federal court and pay $4.5 million in fines for selling 73 million units of bird seed from November 2005 to March 2008 that was coated with pesticide known to be deadly to birds and fish. Pesticides were added to protect the product from insects during storage, notwithstanding that Storcide II, one of the pesticides used, was clearly marked as extremely toxic to birds. Records show that its own experts warned of the risk in the summer and fall of 2007 and yet Scotts continued to sell the deadly product until March 2008. In 2008, Scotts Miracle-Gro also falsified pesticide registration numbers required by the U.S. Environmental Protection Agency on its products. On September 7, 2012, in Ohio, a federal court sentenced Scotts to pay a $4 million fine and perform community service for 11 criminal violations of the Federal Insecticide, Fungicide and Rodenticide Act (FIFRA). In a separate agreement with the Environmental Protection Agency, Scotts agreed to pay more than $6 million in penalties and spend $2 million on environmental projects. According to the Justice Department, both the criminal and civil settlements are the largest under FIFRA to date. Scotts has developed several genetically modified grasses, including herbicide-tolerant Kentucky bluegrass and creeping bentgrass. In 2007, the U.S. Department of Agriculture fined Scotts Miracle-Gro $500,000 when modified DNA from GM creeping bentgrass, was found within relatives of the same genus (Agrostis) as well as in native grasses up to 21 km (13 mi) from the test sites. In 2001 Scotts was involved in a major dispute with nature conservation bodies and the UK Government about the future of several peat bogs in the north of England. Under pressure from the European Union the UK government moved to declare a number of peat bogs, covering an area of 4097 acres in Yorkshire and Cumbria, as Special Areas of Conservation, thus ending Scotts ability to harvest peat for their garden products. During the course of the dispute Nick Kirkbride, the then managing director of Scotts in Britain, described the peat bogs as having "no more conservation interest than a ploughed field". The peat bogs were eventually saved from further destruction by the payment by the UK government of compensation of £17 million to Scotts for loss of the right to extract peat. 1914 - The O.M. Scott & Sons Company was incorporated. 1977 - Scotts introduced its retail product line into Canada through a distributorship arrangement with Home Hardware. 1988 - Scotts acquired the lawn and garden business of Hyponex Corporation, the largest producer and marketer of organic growing media products in the U.S.
1992 - Scotts acquired Republic Tool & Manufacturing Company, providing total quality control over the manufacture of Scotts spreaders. 1993 - Scotts acquired the Grace-Sierra Horticultural Products Company, adding controlled-release fertilizer technologies such as Osmocote, along with other brands including Metro-Mix, Banrot and Peters. In addition, Sierra also brought on board a well-established international organization for manufacturing, sales, and distribution. This organization began in 1964 when Archer Daniels Midland Company produced the first-ever resin-coated controlled-release fertilizer. 1995 - Scotts merged with Miracle-Gro Products, Inc.
1997 - Miracle Care Garden Ltd.: Approximately a third of the growing U.K. lawn and garden products company was owned by Miracle-Gro at the time of the 1995 merger, and in January 1997, Scotts purchased the remaining interest in the company. 1997 - Scotts acquired Emerald Green Lawn Service, which would become Scotts Lawn Service in 1998. 1998 - The company acquired 80% ownership of plant breeding company Sanford Scientific, Inc. (SSI). 1998 - Scotts acquired Rhône-Poulenc Jardin, continental Europe's largest consumer lawn and garden products company. Rhône-Poulenc Jardin manufactures and sells a full line of consumer lawn and garden pesticides, fertilizers and growing media products in France, Germany, the Benelux countries, Austria, Italy, and Spain. 1998 - Scotts acquired the Shamrock brand of U.K. and Irish peat products form Bord na Mona, Ireland. 1998 - Scotts entered into a collaboration with the Monsanto Company to apply biotechnology products to the turfgrass and ornamental plants business. Under the agreement, Scotts and Monsanto agreed to share technologies, including Monsanto's extensive genetic library of plant traits and Scotts' proprietary gene gun technology to produce transgenic turfgrasses and ornamental plants. 1998 - Scotts completed an acquisition with ASEF — a privately held Benelux-based lawn and garden products company. ASEF is a leading consumer lawn and garden products company—with operations in the Netherlands and Belgium — selling fertilizers, growing media, and pesticides. 1999 - Entering into the pesticide industry, Scotts completed agreements with Monsanto Company for exclusive U.S., Canada, U.K., France, Germany, and Australia agency and marketing rights to Monsanto's consumer Roundup herbicide products and for the purchase of the Ortho and related lawn and garden businesses. 2000 - Scotts acquired Substral, a leading consumer fertilizer brand in many European countries, including Germany, Austria, Belgium, France and Nordics. Scotts also purchased Smith & Hawken, a leading brand of garden-inspired products that includes pottery, watering equipment, gardening tools, outdoor furniture and live goods. 2005 - Scotts entered into the U.S. wild bird food market through the acquisition of the Morning Song brand. 2014 - Scotts Miracle-Gro sells wild bird food line to Global Harvest Foods Ltd.
2015 - Scotts Lawn Service merges with ServiceMaster's TruGreen, becoming the largest lawn care company in North America. 2016 - The Hawthorne Gardening also purchased Gavita Horticultural Lighting and American Agritech known as Botanicare to fill out their cannabis portfolio. 2016 - Scotts acquired Blossom, a California manufacturer of Internet enabled sprinkler systems. 2017 - Scotts acquired Can-Filters, a Canadian-based carbon filter manufacturer and fan wholesaler under their Hawthorne Gardening Co. brand. 2018 - Scotts Miracle-Gro announced its plan to acquire Sunlight Supply Inc., a hydroponics supplier, for $450 million in cash and stock. ^ a b "NYSE: SMG - Financial statements". google.com. ^ "The Scotts Miracle-Gro Company". The Scotts Miracle-Gro Company. Archived from the original on 2013-09-07. Retrieved 2012-02-21. ^ "Scotts.com: About Us". The Scotts Miracle-Gro Company. Retrieved 2007-09-19. ^ "Scotts.com: About Us". The Scotts Miracle-Gro Company. Archived from the original on October 17, 2006. Retrieved 2007-09-19. ^ "Miracle-Gro goes public in backing Romney". 9 August 2012. ^ Watrud LS, Lee EH, Fairbrother A, Burdick C, Reichman JR, Bollman M, Storm M, King G, Van de Water PK (October 2004). "Evidence for landscape-level, pollen-mediated gene flow from genetically modified creeping bentgrass with CP4 EPSPS as a marker". Proc. Natl. Acad. Sci. U.S.A. 101 (40): 14533–8. Bibcode:2004PNAS..10114533W. doi:10.1073/pnas.0405154101. PMC 521937. PMID 15448206. ^ Pollack, Andrew (July 6, 2011). "U.S.D.A. Ruling on Bluegrass Stirs Cries of Lax Regulation". New York Times. Retrieved 26 February 2015. ^ Editor, Charles Clover, Environment (15 April 2001). "Supplier fights to keep mining at peat bogs" – via www.telegraph.co.uk. ^ Jeffery, Simon (27 February 2002). "Bogs to be preserved for peat's sake". the Guardian. ^ "Lawn Device Startup Bought". ocbj.com. 2016-11-14. Retrieved 2016-11-28. ^ Cherney, Max (April 30, 2005). "Scotts Miracle-Gro to Acquire Hydroponics Supplier Sunlight Supply". MarketWatch. MarketWatch. Retrieved April 17, 2018. This page was last edited on 7 April 2019, at 17:27 (UTC).